Do you want to create a new website? Redesign an old homepage? To be successful on Google, Bing and on other search engines, one thing is indispensable: the right keywords. We will show you which keyword types there are, how to find the right keywords, and how to search them. These keywords are entered by the user into a search engine to find a domain or a specific sub-page of the domain. In the simplest case, he/she enters the domain name into the search engine, e.g., “ebay.de”. This approach may seem ridiculous to an expert; in the language of young people, even the term “googler” is used. However, in fact, many Internet users do not know what an address bar is, or that they can also write the domain name directly there. Not at all, because the user already knows which website he/she wants. Here, the user searches for a general type of information. With the keyword “Orchid”, he/she searches, for example, for nursing instructions, botanical classification, scientific articles, etc. EA search, that is probably done before a purchase, is characteristic of this keyword type. For example, the search words “Test Lenovo Laptop” indicate that the user wants to know how good the Lenovo laptops are; probably because he/she wants to buy one. These keywords indicate a direct transaction intent. In short, the user wants to spend some money! In the simplest case, a product or a service is directly searched for. 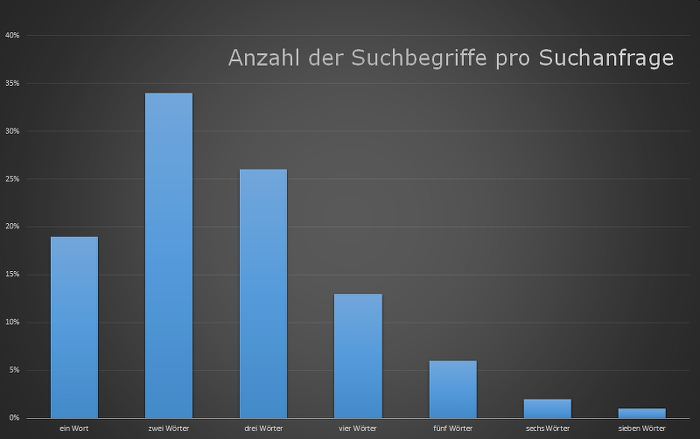 Transaction keywords are equally important for online and traditional shops (hairdresser, plumber, supermarket etc.). Here, short-, mid-, and long-tail keywords are differentiated. Short-tail keywords include only a single word. They have a very high search volume and accordingly, they are very competitive. Whoever wants to score here must put lots of effort into a good ranking. Mid-tail keywords consist of two or three words. They also have a high search volume, but are easier to specify. So the competition is not at a very high level. Long-tail keywords consist of more than three words. They are searched less frequently, are very specialized and the competition is weak here. Texts optimized for certain phrases can appear in the first search results quickly and easily. 3. How many search terms does the average user enter? With 34 percent, two-word keywords are the most popular. Followed by the three-part keywords, with 26 percent, and the one-word keywords with 19 percent. Not all texts need to be optimized for two-word keywords. 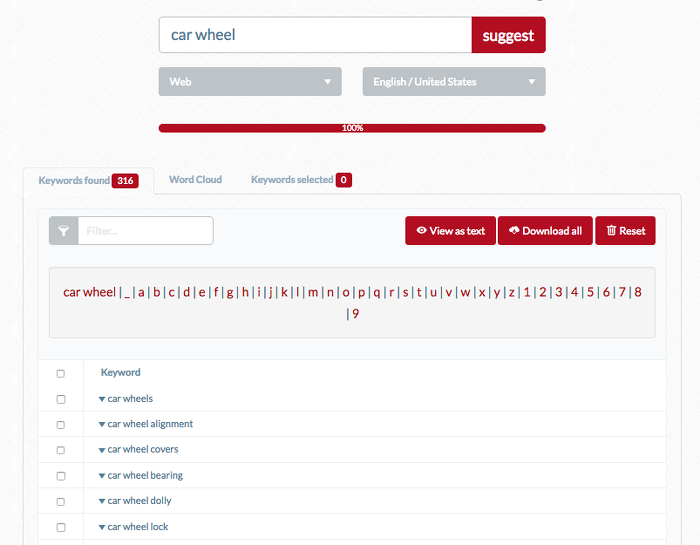 Multi-part keywords (long-tail keywords) can already contain the other search words. Example: The three-word keyword “inexpensive hairdresser Musterhausen” contains the one-word keywords “Musterhausen” and “hairdresser” as well as the more important two-word keywords “hairdresser Musterhausen” and “inexpensive hairdresser”. Collect all the terms that you consider relevant. Do not limit yourself and just write them down. Also note word combinations. In many cases, users are not experts. You will use wrong terms (“screwdiver” instead of “screwdriver”), phrases (“consultant for house purchase” instead of “building expert”) or common synonyms (“private credit” instead of “consumer loan”). Use the language of your users to find the right keywords. You are not sure how your users are searching? Ask them directly or through a survey on your website, Facebook or other social media. Just look at the pages of your competitors. What words and combinations of words do you notice? You can then find the appropriate keywords. Using keyword search tools, you can check how promising words and phrases are found. The tools show how often the keywords are searched, how high the competition is, and they can even suggest new and related search terms. This makes it very easy to find additional keywords. Probably the most important tool of keyword search is Google’s keyword planner. The free tool allows you to easily find new and alternative ideas for search words, and even predicts the traffic of the individual search terms. Also, the tool can combine keywords. To do so, enter a list of your different store transactions and a list of the locations of the stores. The keyword planner automatically combines these lists and displays the expected traffic. Since you can import the keyword lists as CSV into the tool, use of the planner is also very easy with extensive research. Note: The Google Keyword Planner works only with a free AdWords account. Since its update in the autumn of 2016, it has not provided any exact forecasts for customers without an advertising budget. If you still want to have the exact data, you can find the correct instructions on the blog of onpage.org. The Keywordfinder is a search tool that provides very useful results in the free version. A search for a keyword immediately provides its search volumes as well as related keywords and their search volumes. The trend of the individual keywords is also displayed. Also, a very nice feature is the circle diagram “SEO difficulty”. It shows you how simple or difficult it is to rank well with this search term. With a simple click you will find matching long-tail keywords for the search term. You can also enter term combinations and get additional recommendations. You can also find search terms directly in Google search. These are always at the end of the results list. Here we simply searched the term “car tires”. 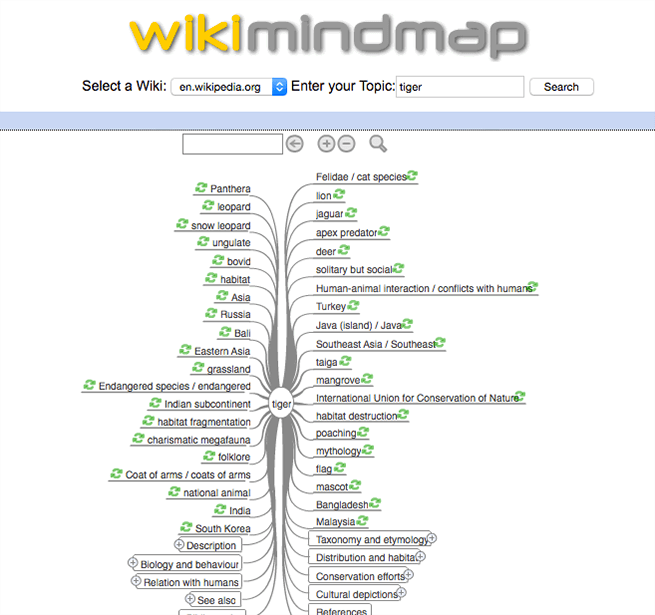 The wikimindmap tool can also be used to search for new keywords. It shows which topics are listed for each keyword on Wikipedia. This allows you to find more specific keywords and new ideas for content. You can also search specific forums for keywords. On which topic do members want information? What are the right keywords? The synonyms dictionary also provides alternatives to known keywords. After you’ve aggregated your keyword list, re-enter it in the Keyword Planner or the Keywordfinder to determine its relevancy. But which keywords are relevant at all?Very simple: keywords with high search volume and low competition , which bring a high conversion rate. What is then a conversion rate? The conversion rate indicates how many visitors of a website become customers. 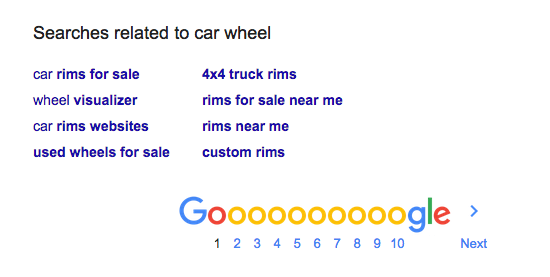 Example: Users searching for the keyword “car tire” do not necessarily have a purchase intent. The conversion rate of this keyword is very low for a tire dealer. However, if the users are looking for “buy cheap car tires”, the purchase intent is clear. If you come across the above-mentioned mid-tail keyword on the merchant website, they are also very likely to buy. The conversion rate of this keyword is high. The Keyword Planner displays the search volume and the strength of the competition. The conversion rate is given by the composition of the keyword. You can test the usability of your keywords by simply typing them into Google. You should choose the type of keyword depending on the type of text and the purpose of your website. Transaction keywords increase your conversion rate when you sell things or offer services. Product descriptions, descriptions of services. Search keywords increase the conversion rate when you offer content that leads the users to service providers and shops. Test reports, comparisons and guides. Information keywords are important for information pages related to the advertisement business, or for companies that want to establish themselves as specialists. Even if there are many possibilities for keyword search, you do not have to exaggerate. The effort and the benefits should always remain within the framework. Well researched keywords are only a part of a successful search engine optimization. In addition, too many keywords will allow Google to regard the website as spam and downgrade it. Therefore, always proceed with the user as your priority. What does he/she want from you when he is looking for this or that keyword? How can you fulfill his/her concerns as best as you can? If you satisfy the visitors with your website, Google will reward it with a good ranking. Dieser Artikel wurde am 16.December 2016 von Thomas geschrieben.